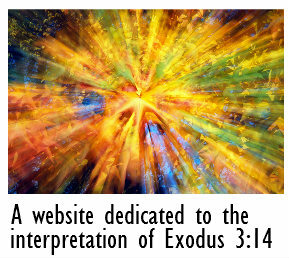 It was in Kabbalah – the esoteric and mystical tradition of Judaism – that the absolute ehyeh of Exodus 3:14b came to assume particular importance in Jewish thought. Kabbalistic writing is often obscure and confusing, even to those familiar with it, and so it is not possible here to give a comprehensive account of the significance of the absolute ehyeh within this tradition. However, an impression of its significance can be obtained from the following quotations taken from the Zohar. First consider an apocryphal exchange between a rabbinic teacher of the 2nd century CE, Rabbi Eleazar, and his father, Rabbi Simeon, in which the former asks the latter to explain the words ehyeh asher ehyeh. Rabbi Simeon answered thus: “Eleazar, my son, the companions have explained it. Behold, everything is bound together in one thing, and the mystery of the thing is Ehyeh. It includes everything…the sum of all, hidden and not revealed”. This interpretation certainly appears to be heading in the right direction relative to the ones we have already considered, in that it appears to be linking the name Ehyeh to God before He created. However, it is too obscurely written to be able to credit it with any conclusive meaning and it thereby exhibits a problem commonly encountered in Kabbalistic writings. Take, for example, another quotation from the Zohar, in which Ehyeh is described as “a sacred name engraved in its extremities”, where “it” is the beginning of Creation. Once again, this statement is clearly associating the name Ehyeh with the very beginning of created existence, but there is too little of it to be able to credit it with any conclusive meaning. However, the feature of Kabbalistic thought that sheds most light upon the importance of the name ehyeh in this tradition is its identification with the concept of Keter Elyon (Supreme Crown), which kabbalists describe as “the supreme mystery of En-Sof” and the “eternal will”. Keter Elyon (or just Keter) is the first of what kabbalists call the Sefirot, which are understood to be the stages in the creative emanation of En-Sof. En-Sof translates as “Without End” and designates the infinite essence that is God. What is most relevant to this paper is that the progression of the Sefirot is understood to correlate to the progressive manifestation of the names of God, and that the first Sefirot (Keter Elyon) has Ehyeh as its correlative Divine name. Ehyeh is therefore identified in Kabbalah as the first and foremost of God’s names. The best example I know of a Kabbalistic interpretation of Exodus 3:14 is that of Menahem Recanati, the 14th century kabbalist and halakhic authority. Like Ibn Ezra and Rashbam before him, Recanati identified Ehyeh as the first person form of the third person name YHWH. However he went one very important step further by explicitly identifying Ehyeh as the holiest of God’s names, this on account of it being the name that God gives to Himself and with which He designates Himself in the first person. Recanati understood this name to denote pure existence – which is identical to the Divine essence – and to contain within it the mystery of existence. He considered the name YHWH to be less holy and to also denote pure existence, but to do so in the third person because it is God’s creations who address this name to their Creator. This is the closest any interpretation in Part I of this paper comes to what I believe to be the true meaning of the name Ehyeh, which I will explain in Part II of this article. These few citations may not make a great deal of sense to many readers of this paper because they do require some acquaintance with ontological speculation for their appreciation, but they should at least be sufficient to give an impression of the importance and prominence of the absolute ehyeh within this tradition, and especially of the ontological proximity to God that kabbalists have assigned to it. Of most relevance to this paper, however, is that ehyeh is not only identified as a Divine name in Kabbalah but as the most holy of Divine names.